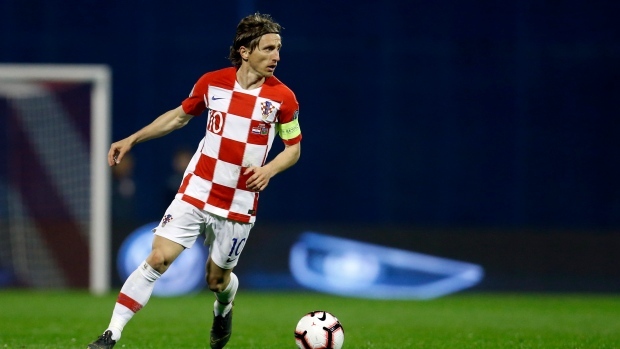 BUDAPEST, Hungary — World Cup finalist Croatia slumped to a 2-1 defeat to Hungary on Sunday, continuing its shaky start to European Championship qualifying. In a group which looks up for grabs with four teams level on points, Wales began its campaign with a 1-0 win over Slovakia. Fresh off a narrow 2-1 win over Azerbaijan in Group E, Croatia took the lead early but lacked co-ordination in defence, allowing Hungary to level before Mate Patkai snatched the win at a corner. Ante Rebic gave Croatia the lead in the 13th minute. Noticing a Hungarian player on the ground near the corner flag, Rebic moved in behind the defence while staying onside to score when Luka Modric's pass took a deflection off Andrej Kramaric. Hungary equalized with a slick team move, Balazs Dzsudzsak passing into the path of Adam Szalai, who scored from a tight angle in the 34th. When the ball bobbled off a Croatian head at a corner, Patkai was there to stab it into the net for the 76th-minute winner. Hungary could have scored another soon after if not for Ivan Rakitic blocking on the goal-line. Earlier, Daniel James' first international goal gave Wales the lead after five minutes against Slovakia before Ryan Giggs' team held on to win 1-0. James dispossessed defender Peter Pekarik and shot from the edge of the penalty area. Gareth Bale missed chances for Wales, while Harry Wilson wasted an excellent opportunity in the 61st when he was unmarked in the box. Slovakia dominated the last half-hour but smart defending and some Wayne Hennessey saves helped Wales cling on. Croatia, Hungary, Wales and Slovakia are level on three points. Last-placed Azerbaijan has no points.